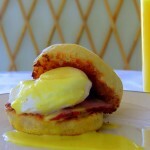 When I think of Eggs Benedict, I think of my honeymoon. Everything about this trip was “magic” as the Kiwi’s say. During the middle of our trip we were staying at a lovely bed and breakfast near Gisborne, New Zealand. Our host was a man who had excellent taste in food, beverage, and architecture among other things. He had a sophisticated coffee setup in his kitchen, and his favorite beer was Corona which he imported at extra expense. When we woke up the first morning, he made breakfast right in front of us. To start, he made us each a custom brewed cup of espresso, then he began the process of creating a masterful eggs benedict. The artistry and effort of our host made this breakfast most memorable. In an attempt to create the foundation for the sandwich, these English Muffins have to be the best thing I have made. They are in a whole other realm than the store bought variety. These simple muffins are fulfilling, and semi-instant gratification. I just threw the ingredients in the bread machine, let it make my dough, and then flipped them on a corn meal sprinkled griddle. Easy as that, and oh so good! Side note: Some recipes call for using a muffin ring, or even tuna cans to let the dough raise into the perfect form. I didn’t use either one, I just flattened the muffins into approximately 3″ rings, and they came out beautifully. Also, make sure to use a fork to open the muffins, not a knife in order to reserve the nooks and crannies! 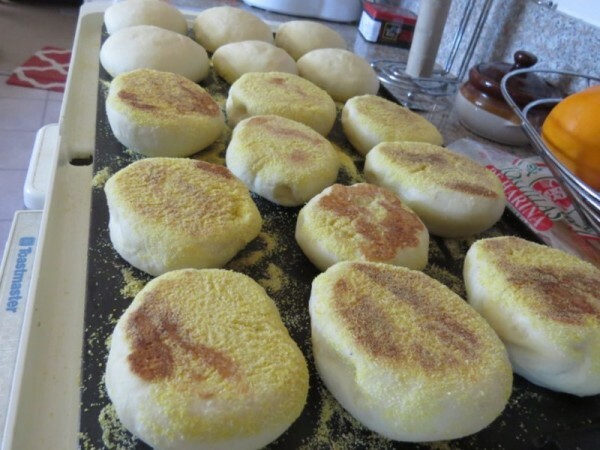 Incredibly simple and delicious english muffins. Combine all ingredients except the corn meal into the bucket of a breadmaker. Set it to the dough cycle. Mine took 1 hour and 50 minutes. Remove dough onto surface and punch down. Divide into 16 pieces and form them into balls. Generously spread the corn meal onto a griddle which has been sprayed with cooking spray. Flatten the balls until they are 1/2" tall and let sit on the griddle for 20 minutes covered in a clean towel. Let the muffins brown on each side for approximately 7-8 minutes per side. Muffins are done when they are 200° measured with a thermometer. 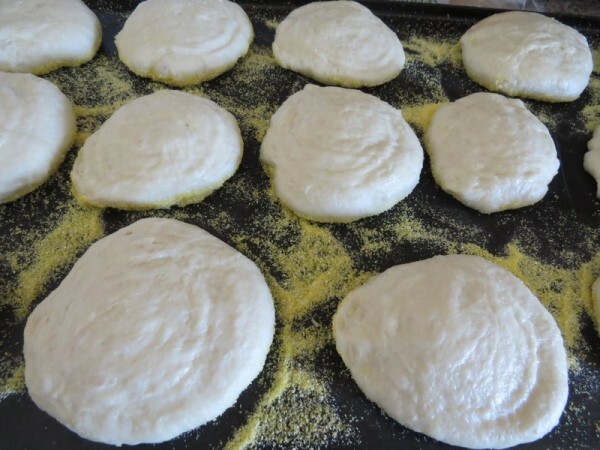 This English Muffin recipe is adapted via King Arthur Flour. Posted in Bread Machine, Breakfast Breads, Yeast BreadsTagged breadmachine, english muffinBookmark the permalink. 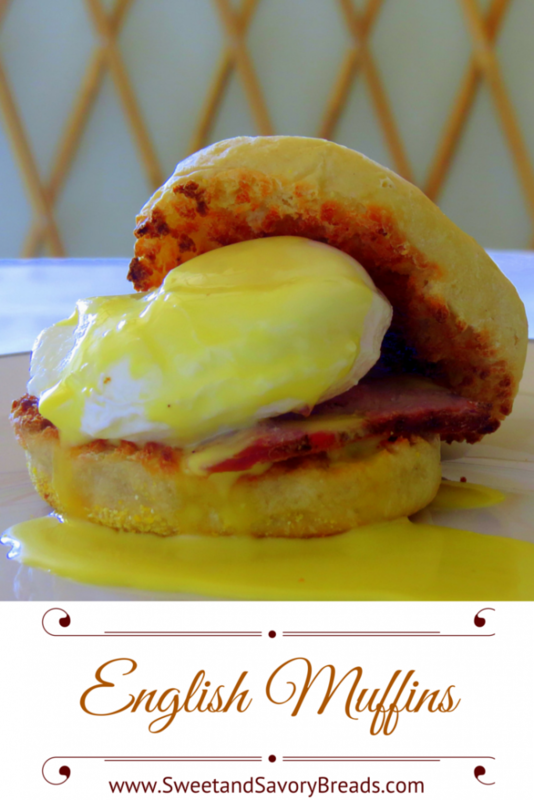 I make English muffins (She Who Must Be Obeyed is addicted to Eggs Benedict). However, I use muffin rings and my dough is halfway between a batter and a dough. I the shape of yours is more home made looking. I may have to give your recipe a try!